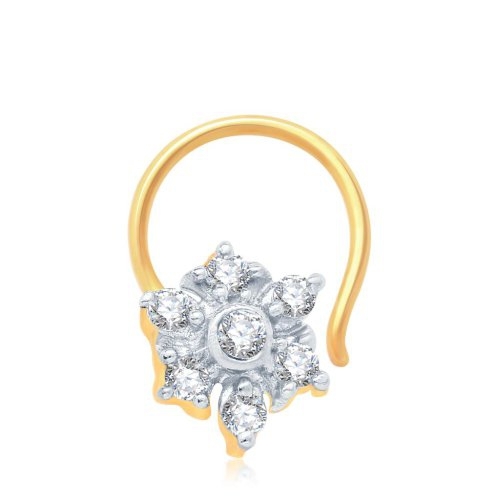 • Brand: Sukkhi • Product Type: Nose Pin• SKU: 36029NPCZK200• Colour: Golden and White• Material: Alloy• Plating: Gold and Rhodium• Stone Used: Cubic Zirconia• Design: CAD/CAM• Dimension: Weight: 1g• Description: This Sukkhi Glittery Gold and Rhodium Plated CZ Nose Pin is made of alloy. This Nose Pin is studded with cubic zirconia (CZ) stone. The model of the Nose Pin is made of CAD/CAM design which gives look of real diamond jewellery. The plating of the metal done by 18ct. Gold. 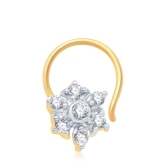 This Nose Pin has high end fashion design which has elegance and style. That will add radiance to the natural beauty of a woman.• Care label: Avoid of contact with water and organic chemicals i.e. perfume sprays. Avoid using velvet boxes, and pack them in airtight boxes. After use , wipe the jewellery with soft cotton cloth. • Note: The image has been enlarge for better viewing. • Disclaimer: Product colour may slightly very due to photographic lighting source or your monitor settings.